This is a convenient place to stay if you're in Amsterdam for just one night or need to leave town early in the morning. 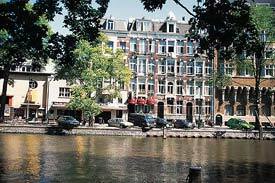 It's very close to the Centraal Station, where frequent trains serve Amsterdam Schiphol Airport. The hotel has 106 rooms, all with rain showers and free Wi-Fi. This three-star deluxe hotel was once a warehouse of the East India Company. It has 50 rooms, each with a work desk and free Wi-Fi. Amsterdam's Central Station is only three or four minutes away on foot. The Cornelisz is on a shopping street near major museums and other tourist attractions. (The Leidesplein is 5 minutes away on foot.) The hotel offers free Wi-Fi in all 51 rooms. It's only a five-minute walk to the Leidseplein from this building in the Jordaan district, which was built as a diamond factory in 1886. If you can't decide between the area's many bars and nightclubs, try the hotel's own caf�-bar. Looking for a comfortable hotel in the heart of town? The Multatuli fits the bill with 29 singles, doubles, triples, and quads in a traditional brick building just two blocks from the Damrak and three blocks from Centraal Station. Rooms are furnished in a modern style (some with a nautical theme) at the Piet Hein, which faces the Vondelpark in the Museum Quarter. The hotel has a garden with terrace where breakfast is served in warm weather. Wi-Fi is free, and an Internet terminal is in the lobby. The Rho occupies the former quarters of a gold-trading company, and the Art Deco lobby once belonged to a theatre. It's near the Dam square in central Amsterdam. Parking is available, and you can rent bicycles for sightseeing.